The Local Scoop grew out of a need to propagate the local news and events for the southern Ontario-based NANPS (North American Native Plant Society). The first Local Scoop e-newsletter was sent to local NANPS members and plant enthusiasts in April 2008 to spread the word about the NANPS Annual Plant Sale and Expo. The Local Scoop flourished and began to include announcements from other organisations and eventually the Scoop's own commentary on native plant and environmental issues. Later, The Local Scoop website was seeded. It's initial purpose was to house the Scoops past and present, but over the seasons it branched out to include the scope of the Scoop that you see today. 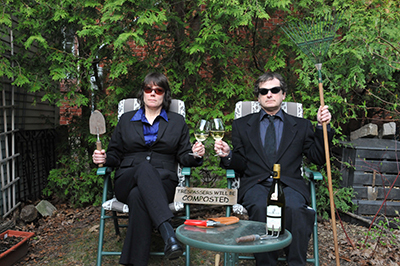 In April 2010, TLS published the landmark Big Bad Bylaws issue wherein the Scoop wrote 8 articles skewering local bylaws affecting vegetation and fence height restrictions, as a result of over zealous bylaw officers chopping down gardens and trees in the Toronto area. This was also the germination of the Scoop's own ScoopArt - used to aptly illustrate the need for bylaw reform and give plants a voice! Check out the Art Hives gallery which features all ScoopArt drawings used in The Local Scoop and on the website to date. The in-depth articles in the newsletter were slowly phased out in favour of publishing them on the website and on blogs. Slowly The Local Scoop N&E (News & Events) took shape, which primarily contains local calendar updates and announcements. In 2011, The Scoop authored and self-published "A Cautionary Tale for those who would disturb the Natural Order" titled: A Tale from FarrWoods which documented in photos and captions the destruction of a woodlot to make way for a highway. Over a thousand of these plants took refuge in ZooWoods, a teaching and research facility at the University of Toronto. As Steward of Zoo Woods, The Scoop is in the process of rehabilitating the site with additions from other plant rescues, as well as plant sales and donations through NANPS. In 2011, LuxCal the world's best online calendar, was added to the Scoop's website. The calendar has undergone several upgrades since then (with the grateful assistance of its creator, Roel Buining). Now the largest source of information in southern Ontario for native plant and environment events, the calendar continues to grow in popularity. The Scoop is constantly being approached by various organisations to have their events added to the Scoop's calendar. Check out the 'Options' button (top left) to see its uniquely featured year, month, week day, upcoming and changes views, and a view to filter by Category. In 2012, Carole Sevilla Brown at U.S.-based NPWG (Native Plants And Wildlife Gardens), having read and admired the Scoop's writing asked The Scoop to join the monthly blog contributors as one of the few Canadian writers. The Scoop and Scoop's photographer and Web Developer (ScoopAssist) regularly attend and document events and excursions in Toronto and southern Ontario. Some of the photos from these events are on this site in the Pix pages. The Local Scoop will always be commercial free. We are proud to volunteer and contribute to promoting native plants and their benefactors.